BBC membership is predicated simply on the basis of an eagerness to engage in group rides on a safe and courteous manner and promote the BBC mission. Members will be required to execute a Membership Agreement and Liability Waiver substantially in the form set forth below or in the downloaded PDF, and to purchase and regularly wear a BBC team riding kit. Please print and sign the form and bring it to your first group ride. For further information, please go to the BBC Groups.io page or “CONTACTS”. I understand that bicycling is an inherently dangerous activity that can result in serious injury or death. 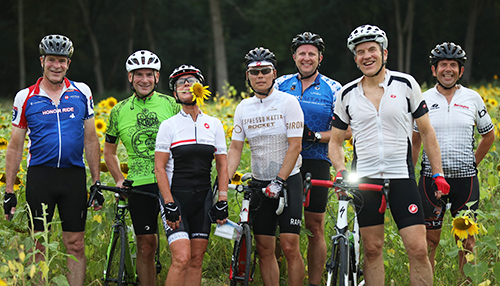 I also recognize that Barrington Bicycle Club activities may take place on public roads open to motor vehicle traffic and containing other hazards to bicyclists. Mindful of these risks, and in consideration of the privileges of Barrington Bicycle Club membership and the receipt of releases and waivers of other members, I release and waive any and all claims against the Barrington Bicycle Club, its officers, and its members for all damages incurred at or associated with any Barrington Bicycle Club activity for myself, my heirs, and my executors and assigns. Sending this form constitutes agreement with the above terms.